Since the last newsletter the Association has not had much activity but in the near future many significant activities will occur. Firstly the Annual General Meeting and Dinner will be held at the United Services Club on Friday 6 September 2013 at 1900 for 1930 hours. The night is a very relaxed dinner during which the necessary activity for the conduct of an Annual General Meeting occurs. At the end of the dinner we look forward to a brief update of the status of the Regiment given by the Commanding Officer. The cost of the dinner is $80. If you wish to attend please go to the notice about the dinner in this newsletter and email Peter Morton your attendance. Payment can be made by electronic means or payment is accepted on the night. As usual the old executive management committee will stand down from their positions and a new committee will be formed (President, Vice President, Secretary/Treasurer, Membership Secretary/Website Manager, History Manager, Newsletter Editor, Committee members.) Should you be prepared to be available for any of the positions please let me know and I will make the necessary arrangements for your nomination to be go forth. We must congratulate John Byrne for his service to the legal profession when he received an honour in the Queens Birthday Awards. Also to Paul Smith on his appointment as a District Judge in the District in Rockhampton. On 10 August the Association will present prizes for military excellence to the recent graduates from the RMC course. When one looks at history, QUR graduates have gained the honour of the highest marks in the courses in more than their share of times. 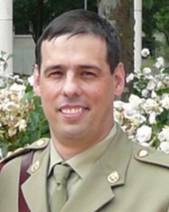 It proves what we all know of the quality of the candidates and the excellent training and administrating given by the Regiment. Again the Association will present the book “The Fighting Ninth” by Major Clarrie Wrench as the awards. I have received information from the Regiment that a combined Officers /Sergeants Regimental Dine In Night is being planned for 12 October 2013 - more to follow. You will probably be bored with me constantly speaking of the history of QUR. Recently Ian Bunce, Garry Collins and myself met with Major Luke Hughes, 2IC QUR and Major Ray Janowicz to discuss the organization of the items of historical significance of QUR. At that meeting we resolved to work with QUR to display as many items of history in the display cabinets in the depot. Additionally we will work to finish the copying of our history documents to electronic medium. At the AGM in 2012 the Association voted to be responsible for the preservation any records, photos or history of the units – OCTU and RURQ (QAC). Brian Venz and Colin Ahern have also volunteered their time to assist in this project. I look forward to catching up with you at the AGM/Dinner on Friday the 7th September at the United Service Club. As of the 1st of August QUR will enter a new phase of growth and expanded responsibility. On this date QUR will begin to assume command of most of the pre-Initial Employment Training (IET) soldiers of 11 Brigade. This initiative has the aim of both improving the throughput/retention of trainees and allowing 11 Brigade unit commanders to focus of the collective training outcomes required under PLAN BEERSHEBA. QUR will be responsible for the preparation and training of all 11 Brigade enlistees prior to attendance at Army Recruit Training Centre. After completing ARTC trainees allocated to Arms Corps will remain with QUR until completion of the Combat Arms Module. RAINF trainees (being the most numerous) will remain with QUR until completion of the RAINF Module 2 at which point they will graduate into their posted battalion. To manage this task QUR has grown to include a Brigade Induction Cell in both Brisbane and Townsville. These cells will be responsible for over 300 soldiers across Queensland. This will be a significant challenge for QUR but represents a strong endorsement of our capability and professionalism. QUR Officer Cadets continue to perform strongly on the national Training Blocks. This month 11 QUR members were commissioned at RMC on the completion of their final Training Block. Notably LT David Jones (NQ – posted to 31/42 RQR) won the Sword of Honour and LT Simon Freestone (Brisbane – posted to 2CER) won the Physical Training prize. Also, OCDT Chris Rawlinson was Student of Merit on Training Block 2 held in July. I would like to congratulate all of the new LT and wish them well in their careers. The next year will see an important upgrade of the ARES courses in the Army All Corps Officer Training Continuum (ACOTC). The First Appointment Course (FAC), the Grade 3 courses and the Grade 2 courses will all transition to new packages that are closely aligned with the equivalent ARA courses. These important changes will take considerable effort and focus to implement but will result in many benefits for ARES officers. The Annual General Meeting for the QUR Association will be held at the United Service Club, Wickham Terrace, Brisbane on the evening of Friday 6 September 2013 at 1900 for 1930 hours. I will be attending the Association’s Annual General Meeting Dinner to be held at the United Service Club, Wickham Terrace, Brisbane on the evening of Friday 6 September 2013 at 1900 for 1930 hours. I understand that from 3 September 2013 should I later find that I cannot attend, I will be liable to pay for the function. Many thanks for the update and congratulations to John. Unfortunately I am unable to get away from Canberra to attend the Brisbane events. By the way, I have just been granted a Compulsory Age Retirement (CRA) extension until the end of 2014 (and Army is suggesting even beyond that, but I think my good wife will have other ideas!) so I will continue to serve on at AHQ for a while longer. We are hoping to retire to Queensland, probably around the Brisbane area (our son, daughter-in-law and three grandchildren live in Brisbane). 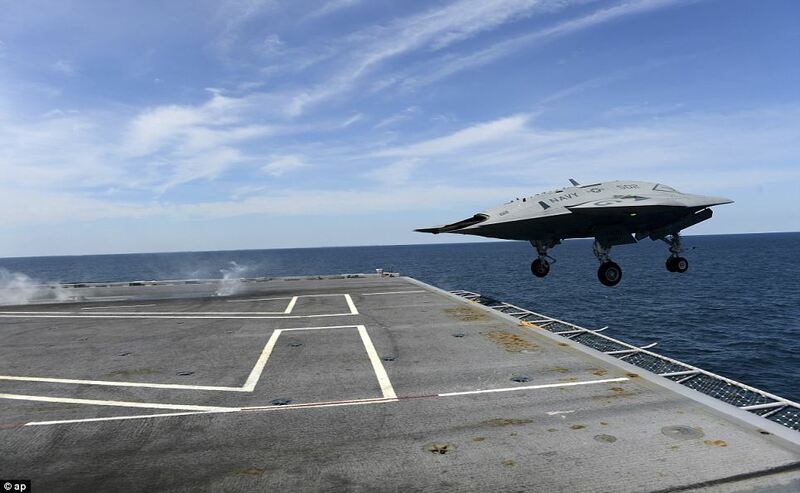 The U.S. Navy launched an unmanned, autonomous aircraft the size of a fighter jet from a warship for the first time today, a development that could herald the end of Top Gun-style piloted air combat missions. 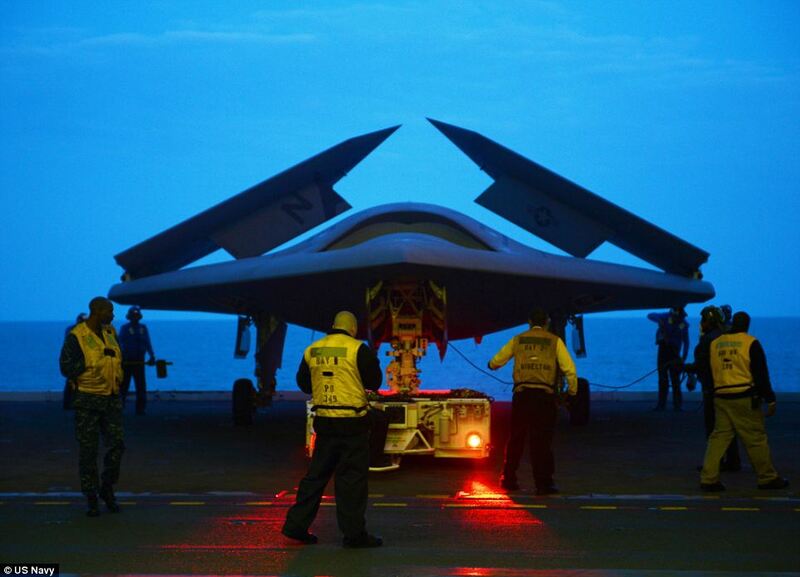 The X-47B drone is the first designed to operate an aircraft carrier, which allows it to be used around the world without needing permission to take off from airfields in other countries. But there are concerns about the legality of what has been dubbed America 's 'covert drone war'. Strikes cause widespread civilian deaths and operate with only limited oversight, critics say. 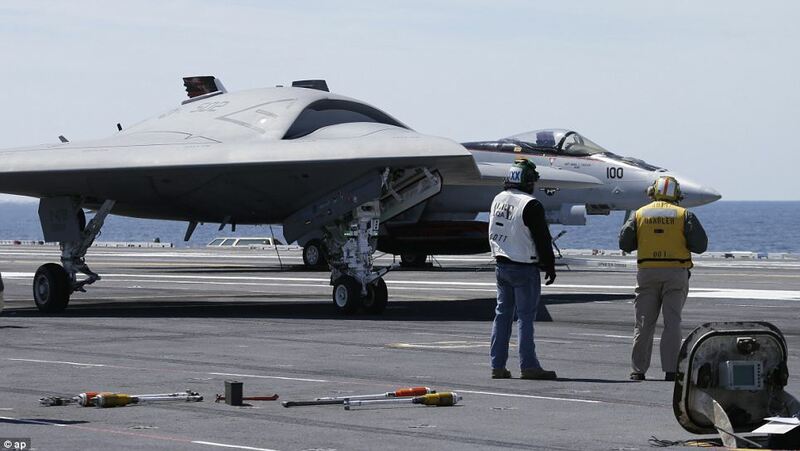 Aside from its ability to operate from aircraft carriers, another big difference between the X-47B and previous drones is that it does not need to be piloted by remote control. Instead, it is controlled by a forearm-mounted box called the Control Display Unit which sends orders to an on-board computer which is able to use artificial intelligence to think for itself, plotting course corrections and charting new directions. 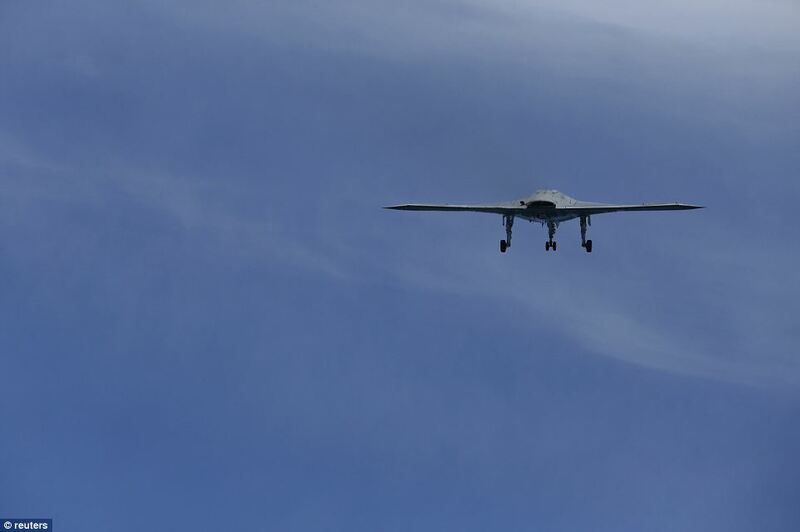 The unmanned drone will be set an objective by a human operator, for example a target to look at or bomb, and then it will navigate its way there using technology such as GPS, autopilot and collision avoidance sensors. Critics have warned the introduction of such AI into military weapons systems is a step towards the development of autonomous 'killer robots'. 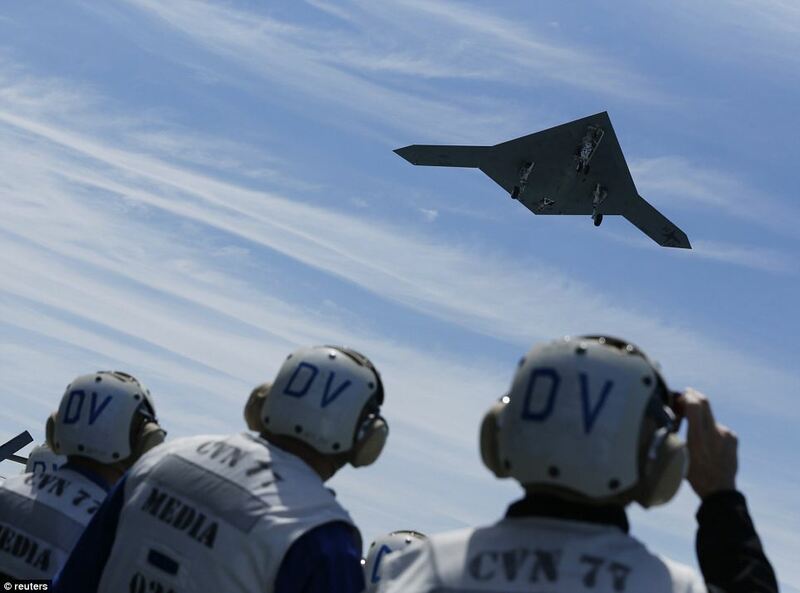 Navy officials say the drone will give them around-the-clock intelligence, surveillance and targeting capabilities. 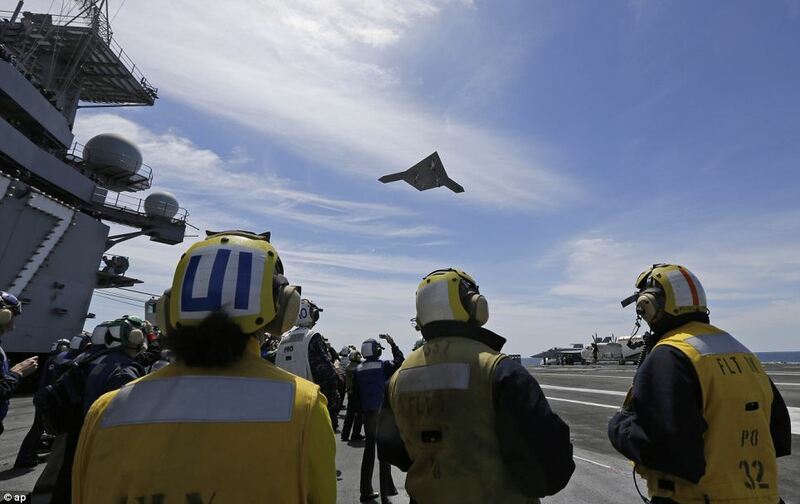 The prototype X-47B took off successfully this morning from the nuclear-powered aircraft carrier USS George H. W. Bush in the Atlantic Ocean off Virginia and made two low approaches to the ship before heading back toward land. 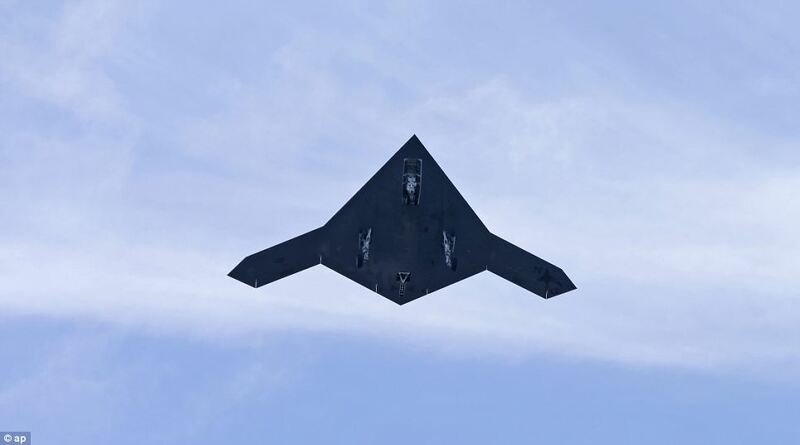 The test aircraft, which has been designed and built by the weapons maker Northrop Grumman, isn't intended for operational use; instead, the military is using the information it gathers during these demonstrations to develop the drone program. The Navy already operates two other unmanned aircraft: the small, low cost ScanEagle, which does not carry weapons; and the Fire Scout, which is armed but built more like a helicopter. Both the military and the CIA use armed Predator and Reaper drones in surveillance and strike operations around the world. But while the military uses them routinely alongside troops in Afghanistan and other warzones, the spy agency has conducted frequent strikes in countries in which the U.S. is not officially at war. Over the past 11 years in Yemen , 333 people have been reported killed, including 47 civilians, among them two children, in confirmed U.S. drone strikes, according to figures collated by the Bureau of Investigative Journalism. A suspected 96 further drone attacks in the Middle East country have killed as many as 445, including 50 civilians and ten children. In Somalia over the past six years, as many as 27 have been reported killed by drones, with up to 15 of those reported as being civilian bystanders. And in the border regions of Pakistan, where the U.S. has carried out the most covert drone strikes, as many as 3,533 people, including 884 civilians (197 of whom were children), have been reported killed by CIA drone strikes over the past nine years - triggering sharp criticism from the government there. Although the drone attacks were started under the Bush administration in 2004, they have been stepped up enormously under President Obama. Obama's top counter-terrorism adviser, John Brennan, has argued the U.S. has the right to unilaterally strike terrorists anywhere in the world. 'Because we are engaged in an armed conflict with al- Qaeda, the United States takes the legal position that, in accordance with international law, we have the authority to take action against al-Qaeda and its associated forces,'he told a conference at Harvard Law School last year. 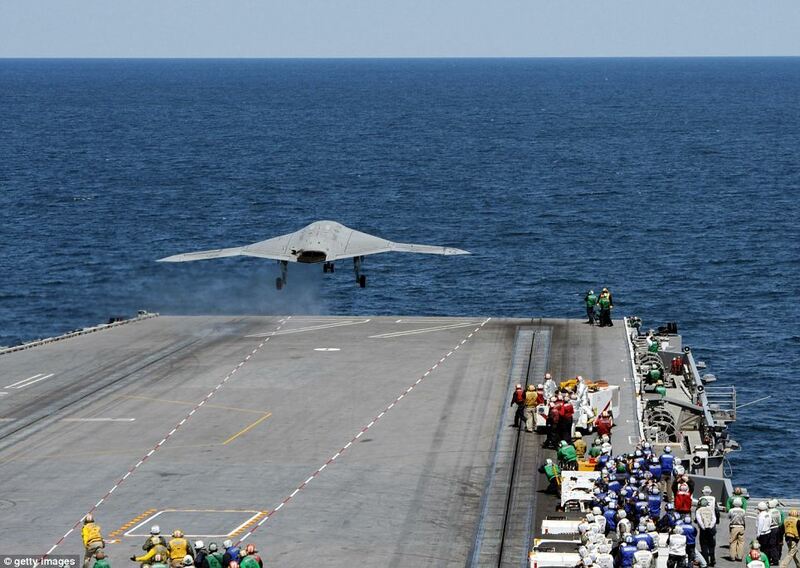 The X-47B can reach an altitude of more than 40,000ft, has a range of more than 2,100 nautical miles and can reach high subsonic speeds, according to the navy. It is fully autonomous in flight, relying on computer programs to tell it where it to go unless a mission operator needs to step in. 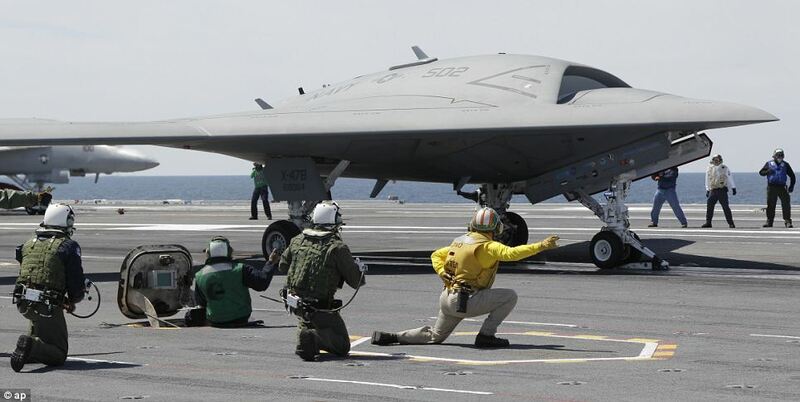 That differs from other drones used by the military, which are more often piloted from remote locations. It is not yet clear whether the drone will be able to open fire without explicit authorisation from its controller. The Pentagon last November vowed that no robot weapon would be able to decide when to attack humans. That promise came as Human Rights Watch issued a warning that autonomous 'killer robots' could find their way onto battlefields within 20 years, or even sooner. The group has called for a pre-emptive ban on the development and use of any unmanned systems that carry weapons and are able to select and engage targets with no human intervention. That possibility is particularly alarming in light of increasing fears that human scientists could one day lose control of computer-based artificial intelligence systems. Cambridge University has even opened a centre where leading academics will study the existential threat that out-of-control robots could potentially pose to humanity. Today's tests show the trend toward greater autonomy 'is not one that is going to be stopped,' said Steve Goose, director of the arms division at Human Rights Watch. 'For us, the question is where do you draw line? We're saying you need to draw the line when you have a fully autonomous system that is weaponised,' he said. The aircraft is as yet not equipped with military hardware, but is designed for ample space to accommodate bombs and surveillance equipment. Not having a pilot eliminated the need for much of the life support equipment and other essentials that humans need to survive at high altitudes, giving it the space for up to two 2,000lb bombs. 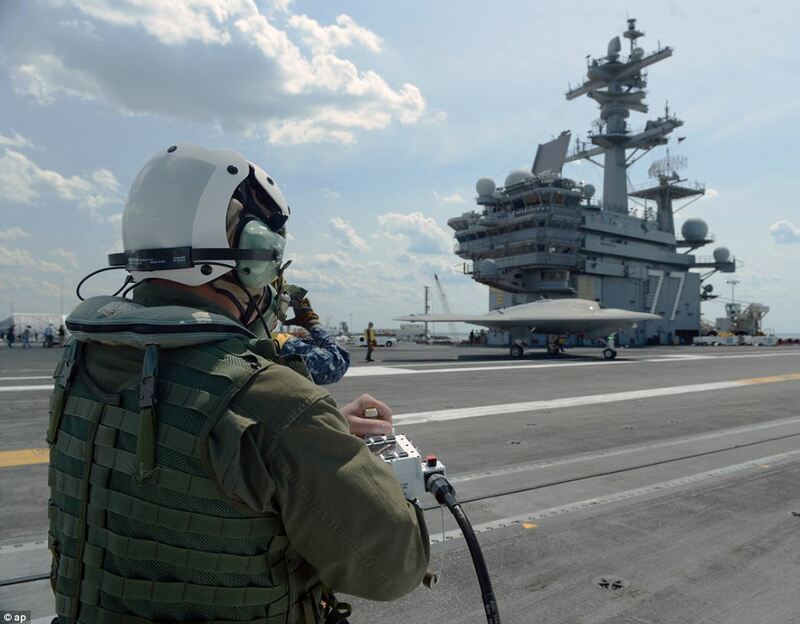 Before the drones can become commonplace, however, the military has to prove they can operate in the harsh conditions aboard an aircraft carrier at sea. The aircraft used a steam catapult to launch, just like a traditional Navy warplane does. 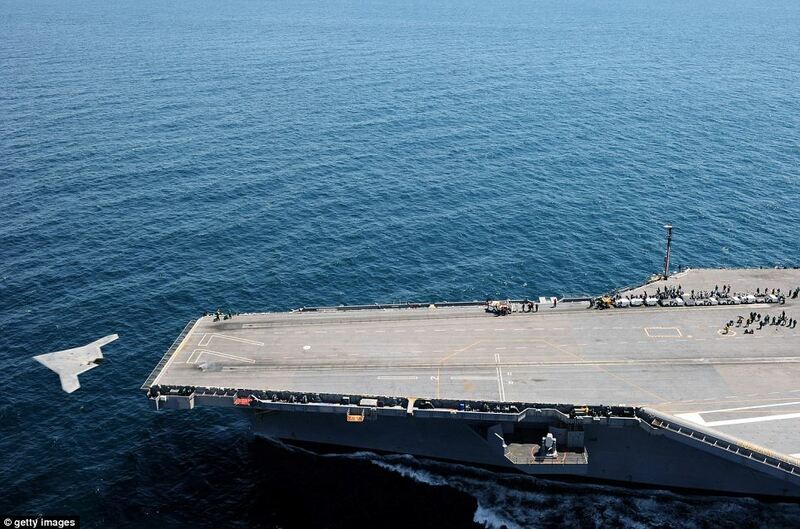 While the tailless plane has not yet landed on the aircraft carrier, the Navy plans to conduct those tests soon. Landing on a moving aircraft carrier is considered one of the most difficult challenges Navy pilots face. 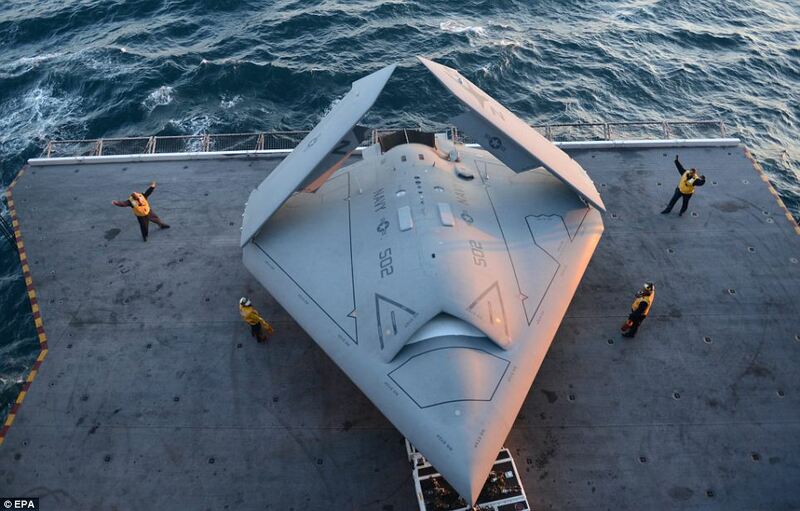 'These are exciting times for the Navy as we are truly doing something that has never been done before - something I never imagined could be done during my 29-year naval career,' said Rear Admiral Mat Winter, the Navy's program executive officer for unmanned aviation and strike weapons, in blog post published yesterday. 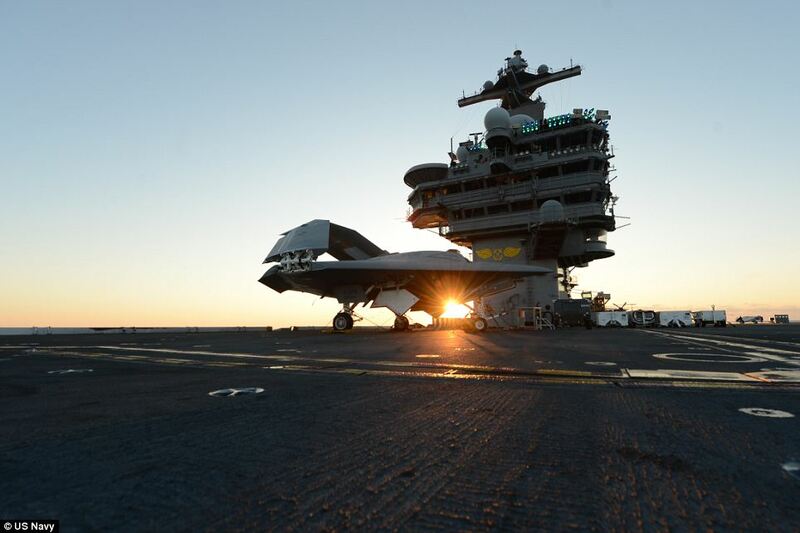 Following the test launch, the plane made a series of approaches toward the aircraft carrier before landing at Naval Air Station Patuxent River in Maryland . 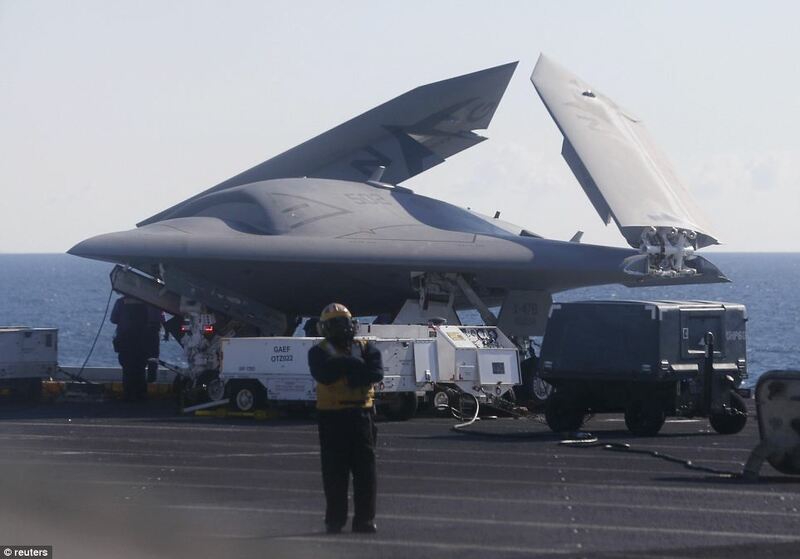 Earlier this month, the Navy successfully conducted a landing at that air station where the X-47B used a tailhook on the aircraft to catch a cable and suddenly stop, just as planes landing on carriers have to do. 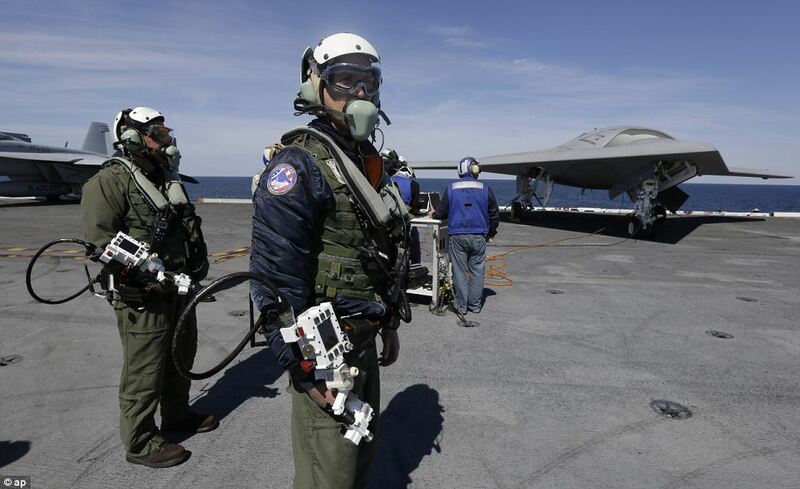 In the 2014 fiscal year, the Navy plans to demonstrate that the X-47B can be refuelled in flight. The program cost is $1.4billion over eight years. 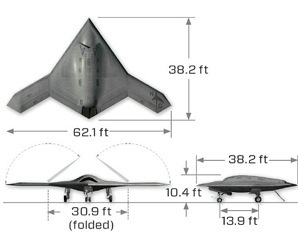 A planned variant of the craft, the X-47C will have a larger payload provision of 10,000lbs and a wingspan of 172ft. • A member of Parliament to Disraeli: "Sir, you will either die on the gallows or of some unspeakable disease." • "He had delusions of adequacy." •"He has all the virtues I dislike and none of the vices I admire." • "I have never killed a man, but I have read many obituaries with great pleasure." • "He has never been known to use a word that might send a reader to the dictionary." • "Thank you for sending me a copy of your book; I'll waste no time reading it." • "I didn't attend the funeral, but I sent a nice letter saying I approved of it." • "He has no enemies, but is intensely disliked by his friends.."
• "I am enclosing two tickets to the first night of my new play; bring a friend, if you have one." • "Cannot possibly attend first night, will attend second ....if there is one." - Winston Churchill, in response. • "I feel so miserable without you; it's almost like having you here." • "He is a self-made man and worships his creator." • "I've just learned about his illness. Let's hope it's nothing trivial." • "He is not only dull himself; he is the cause of dullness in others." • "He is simply a shiver looking for a spine to run up." • "In order to avoid being called a flirt, she always yielded easily." • "He loves nature in spite of what it did to him." • "Why do you sit there looking like an envelope without any address on it?" · "His mother should have thrown him away and kept the stork." • "Some cause happiness wherever they go; others, whenever they go." • "He uses statistics as a drunken man uses lamp-posts...for support rather than illumination." • "He has Van Gogh's ear for music." • "I've had a perfectly wonderful evening. But this wasn't it." 34. CAN AN ATHEIST GET INSURANCE AGAINST ACTS OF GOD ? The practical value of history is to throw the film of the past through the material projector of the present onto the screen of the future. Every battle has a turning point when the slack water of uncertainty becomes the ebb tide of defeat or the flood water of victory. Revolutionary war is an antitoxin which not only eliminates the enemy’s poison but also purges us of our own filth. Perhaps there is nothing in the whole of creation which knows the meaning of peace. He who would live must fight. He who does not wish to fight in this world, where permanent struggle is the law of life, has not the right to exist. The greatest commander is he whose intuitions most nearly happen. Put a man in a hole, and a good battery on a hill behind him, and he will beat off three times his number, even if he is not a very good soldier. Do eskimo dancers ever get cold feet? If someone invented instant water, what would you add? If I am a nobody and nobody is perfect, does that mean I’m perfect? Advice is a dangerous gift; be cautious about giving and receiving it. You will never hit your thumb with a hammer if you hold the hammer with both hands. The cemeteries are full of people who thought the world couldn’t get along with them. Monogomy: leave a lot to be desired. Insomnia: Nothing to lose sleep over. Idolise; Eyes that refuse to look at anything. We finally figured out how to stop Granny biting her nails. We made her keep her boots on. The rich man gives small tips because he doesn’t want anyone to know he’s rich, while the poor man gives big tips because he doesn’t want anyone to know he’s poor. Sitting in a room around a table with a hundred dollars in the middle of it are an expensive lawyer, a cheap lawyer and the tooth fairy. Suddenly the light goes off for five seconds, and when it comes on again the hundred dollars has disappeared. Who took it? The expensive lawyer. The other two are just figments of your imagination. Q - How many magicians does it take to change a light bulb? Do unto others before the bastards do it to you.